PCHelpWare is a free remote assistance application for Windows that allows you to easily take control of remote computers. This application is great to use when needing to connect to computers in remote offices or when helping out family and friends. With PCHelpWare, you don’t have to worry about the remote users firewall like you do with UltraVNC or other remote assistance applications. Connecting to the remote computer is as easy as having the end user double click a single executable file. In the following tutorial, I would like to walk you through installing, configuring, and using PCHelpWare. Step 1: Download PCHelpWare and extract the zip file. Open the folder and double click PCHelpWare_viewer.exe. Step 2: Enter an “Alias” which is what you want to call these particular connection settings and enter a password. Set your “Listen Port” to 5500. Make sure this port is open on your router or firewall. If your router supports UPnP then checking this box will automatically forward the router ports. Leave “Direct Connection” checked unless you are using the Repeater service to bypass your firewall. All of the other settings can stay the same. Step 3: Click “Save” and then click “Create Server”. You will be prompted for your IP address. If you are going to be connecting to computers on your network then just enter your internal IP address. If you are connecting to computers over the internet then you will need to enter your public IP address. If you are not sure what it is, go to WhatIsMyIP.com. Remember you will need port 5500 open on your router or firewall. Step 4: Next, you will be asked “Does the user need to enter the password”. Click “No”. Step 5: You will then receive a dialog box with the IP address and password. Click “Ok”. 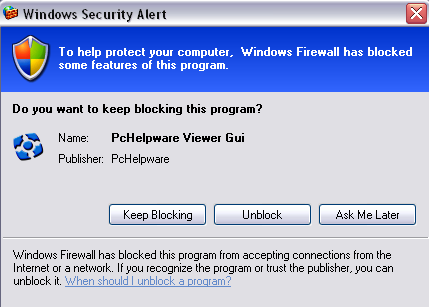 Step 6: If you receive a Windows Security Alert, be sure to click “Unblock”. Step 7: Click the “Start” button in the bottom right corner to start the viewer service. 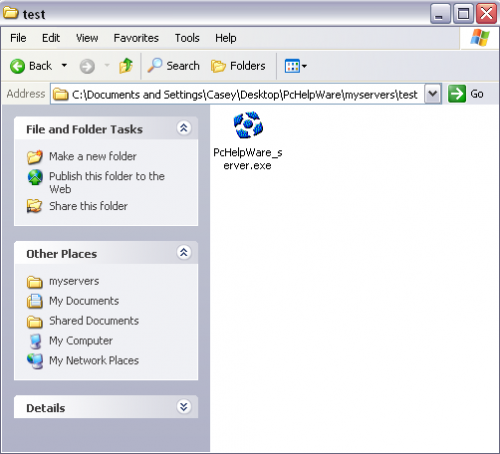 Step 8: Open the folder that you extracted your PCHelpWare files to and navigate to the “myservers” folder. In this folder you should see a folder with the name of the “Alias” you created. 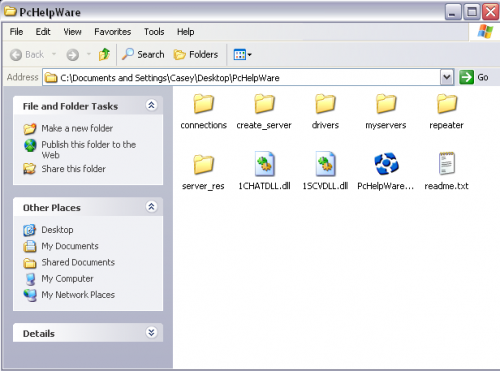 Open that folder and you will see a single executable file called PcHelpWare_server.exe. This is the file that you will need to send to the remote user. Step 9: The remote user will then double click the file and see a login screen. Since you didn’t require the user to enter a password, (see step 4) the user will only have to click “Connect”. You will now be controlling the remote user’s computer. For maximum screen size, click the “Full Screen” button at the top. You will also have the ability to to chat with the remote user. If you have any experience with PCHelpWare or any other remote assistance applications feel free to share. i am setting up everything as you mentioned, but i cant get it work. I’m not sure which part you are stuck at but most problems occur when port 5500 is not open on your router or firewall. 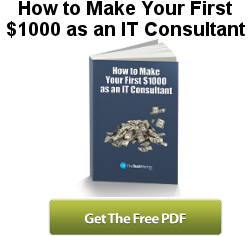 PortForward.com is a great site for helping you do this. Also make sure you are using your public IP address too. Problem with CrossLoop is if you have to support someone who does not have admin rights. With the UltraVNC solution as it’s a stand alone exe anyone can launch it. Otherwise…. CrossLoop is excellent. Most e-mail will not allow you to send .exe files as they are being blocked for virus protection. The following are two options I have used. 1) Put the .exe in a .zip file. Even easier change the extension from .exe to .zip. The either tell the receipent to extract the .zip file or tell the other user to rename the file when they receive it. 2) If you have a website you can just send the link to the file in your e-mail pointing to the file that you have uploaded to your web site. Those are probably the easiest work arounds. I have WinXP Pro and my associate has Vista Home Prem. Will it work cross-platform or will I need to install Vista? This is an entire waste of time. 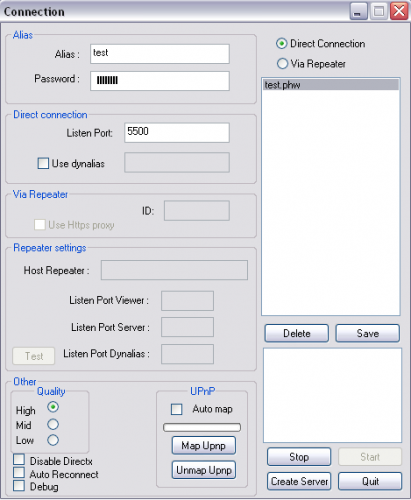 5500 port open in router. Others work okay like Tight VNC, AAMMY, RDC etc but not this program!! Much simpler to setup and less involved. I was never very happy with the insecurity of VNC connections anyway. @Martyd: If you have issues with the insecurities of VNc connections, just install ssh server onto the machines, that way when you need to actually do anything with VNC, you can tunnel the VNC connection through SSH. and for added security, you could use a custom SSH port, like I do. Also, use SSH protocol 2, not 1.. Step 1.5: Download the pchelpware patch and apply it. Unfortunately, there’s no updated download of pchelpware, so you have to do the patching as a separate step. The problem with logmein is that you cannot send an exe. You’ll first need to add all pc’s manaully through to site before you can connect to them. And while log me in is great, the problem is that with other programs users need to give permission before you can go in. Gives the user the security of that we need permission to go in. I was wondering why nobody would mention Teamviewer.